From left, Jinhao Ma, 9, Leting Ma, 16, and Meiting Ma, 17, watch television after dinner at their grandmother's house. Watching TV is the only entertainment they have on weekends. They live in the Mashang Mountain area of Wenzhou, China, where the temperature at night drops below 50 degree Fahrenheit in late March. They put leftover coals in a large basin to keep themselves warm at night. 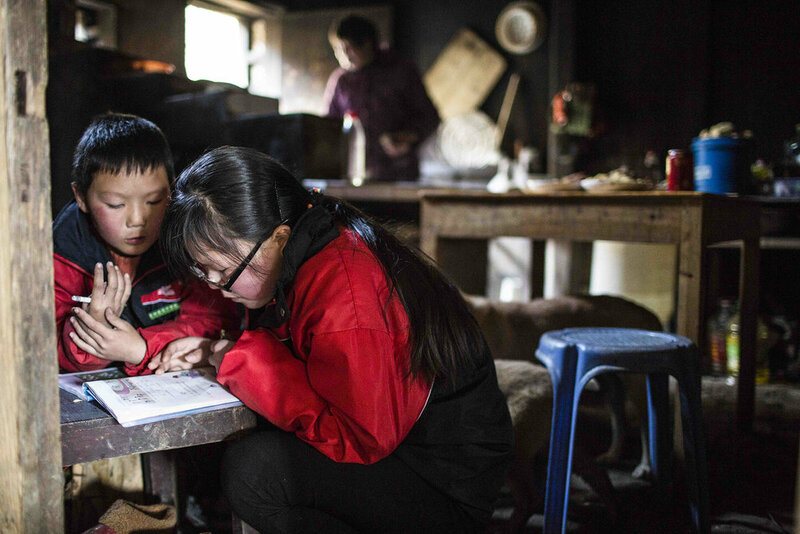 The Ma children are among China’s “left-behind” kids. Their parents are in Shanghai, 250 miles away from Mashang Mountain, working in a breakfast shop to make enough money to raise them. 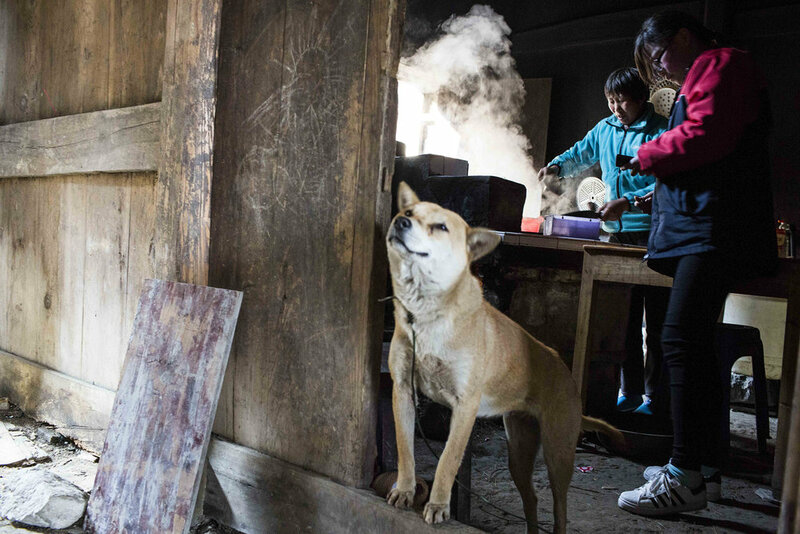 Chunxia Zhu gets out of the bed at around 2 a.m. to start a fire in a coal stove to begin cooking soy beans. It takes several hours on the stove to make the beans soft enough to be ground up with water and sugar to make soy milk. She endures the long days in hopes of providing a better life for her three children. 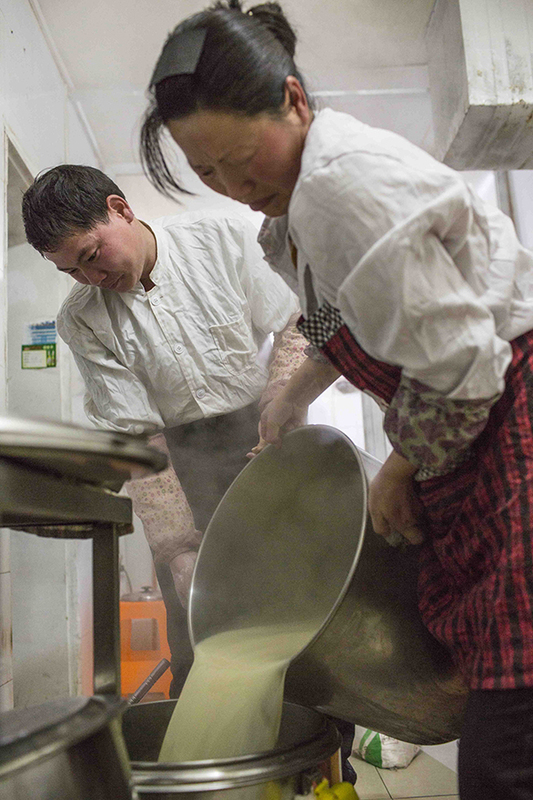 Guocheng Ma sleeps in the breakfast shop underneath the stairway of their suburban Shanghai breakfast shop as his wife, Zhu, prepares soy beans to make soy milk. 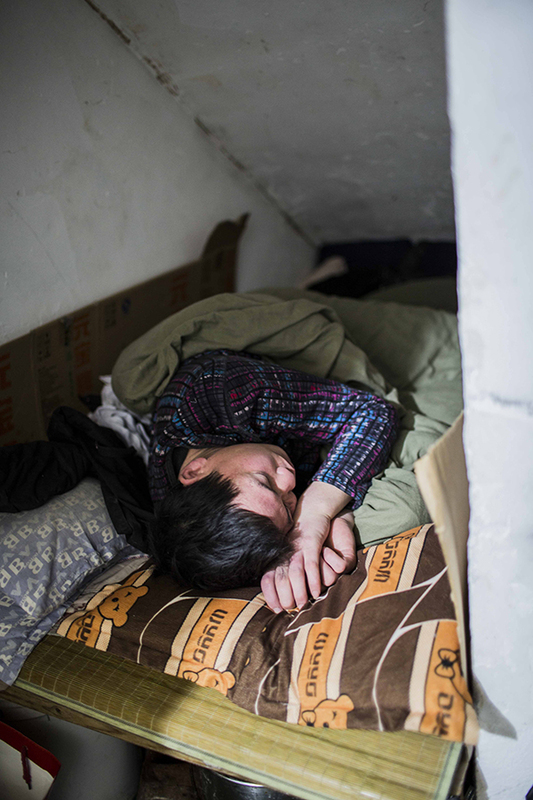 The room is about less than 4 square feet and accommodates both Ma and his wife, who endure these conditions in hopes of providing a better life for their three children. Ma and Zhu pour freshly ground soy milk into a large container. Fresh soy milk is popular for breakfast in Shanghai. They prepare it daily in bulk. Ma drops sesame puffs in a basket after they are cooked in the electric fryer. It usually takes two or three big bottles of fresh oil to fry up these puffs and other local breakfast favorites every morning. Zhu grabs one fried bread stick to make sticky rice roll as she talks to customers. Ma counts money that he and Zhu earned on a Saturday morning. On a busy day they can make more than 100 yuan (equivalent to $15) every morning. "Spring Festival break is probably the best time of the year to make money. Most food places are closed during break, and we are the only one staying open," Ma said. The downside of the lucrative holiday paydays is that Ma and his wife rarely have time to reunite with their children. 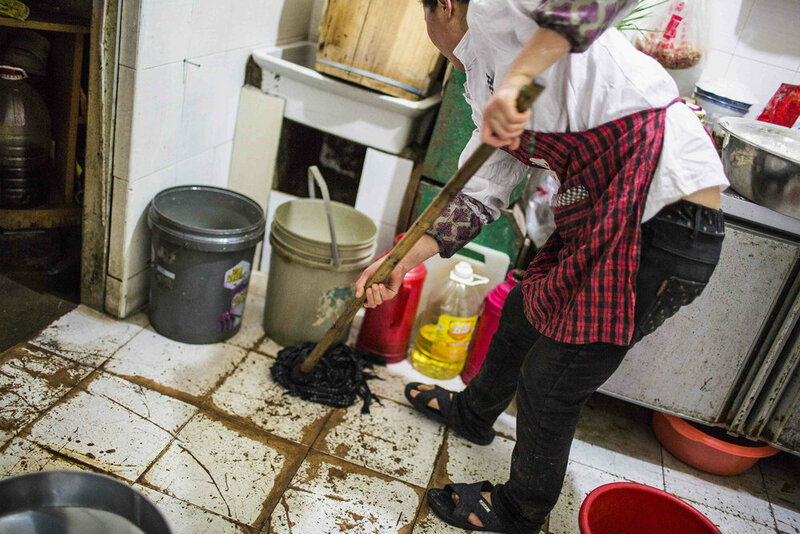 Zhu mops the aged floor in the back kitchen of their suburban Shanghai breakfast shop after the morning service. 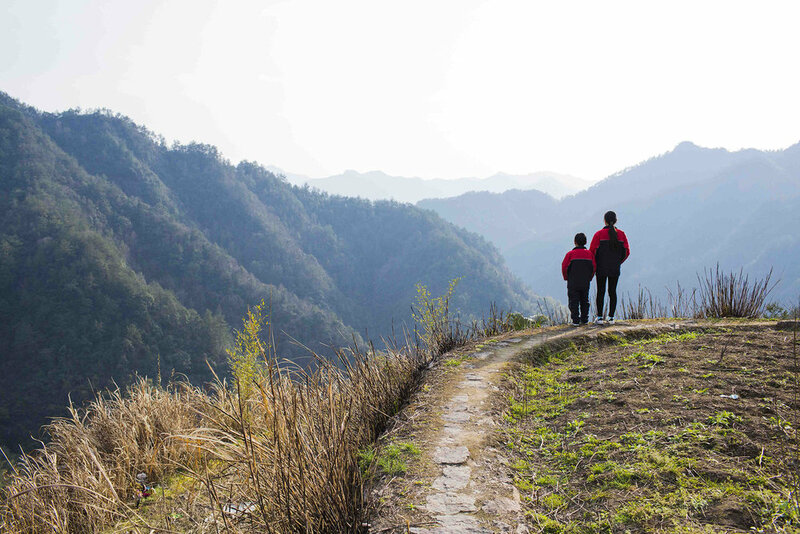 Jinhao Ma and Leting Ma take a stroll before dinner outside their grandmother's house in the Mashang Mount area of Wenzhou, China. Their big sister, Meiting Ma, is away at high school. Chunxia Ma's mother cooks lunch for her grandchildren during a weekend visit to her house. During the week they stay at a boarding school. Jingo Ma paints on the balcony after he finishes his weekend homework. The family hangs their wash outside to dry. Meiting Ma uses spring water stored in a cistern to wash the clothes she and her siblings wear at school. They use the same spring water to brush their teeth and cook. The Ma children live and go to school in the mountains of Wenzhou, Zhejiang, China. It's more than 250 miles (a 6-hour drive on back roads) away from the Ma's breakfast shop in suburban Shanghai. The children see their parents only three times a year. Leting Ma and Jinhao Ma select groceries from a pickup truck that serves as a mobile grocery cart. The vendor drives up Mashang Mount every weekend. These weekly trips provide the people who live in Mashing Mount with daily essentials and food. Leting Ma, left, and Meiting Ma get off the motor-tricycle that transports the children from Mashang Mount to their school 20 minutes away down the hill. The moto-tricycle rides are an occasional luxury. They cost 50 yuan, equivalent to $9. So the Ma children ordinarily walk between school to home, a trek that usually takes more than two hours, even longer when it rains. Leting Ma helps her little brother do his first-grade math homework while they wait for lunch. The bedroom is lined with newspapers to keep out dust. Before the children go to bed, they sometimes have instant milk tea with jelly, which is Jinhao's favorite food. Guocheng Ma and his wife, Chunxia Zhu, returned to their kids in Mashang Mount, Wenzhou, after they subleased their breakfast shop in suburban Shanghai. 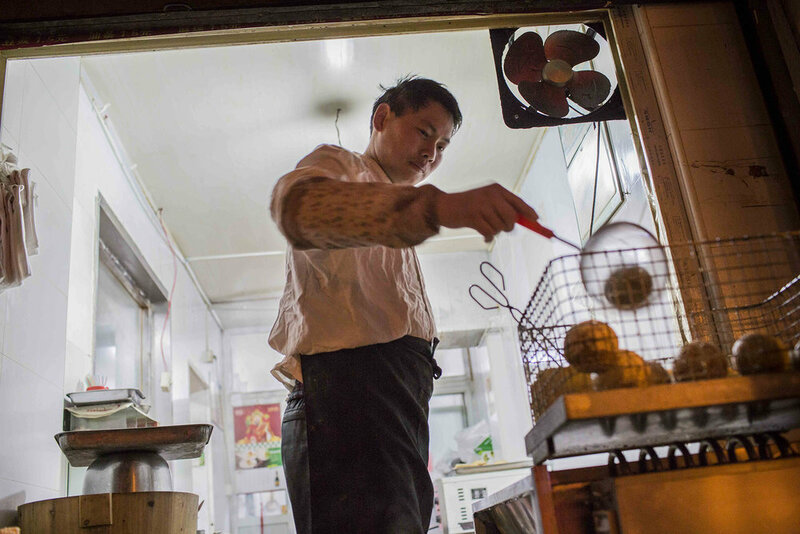 Guocheng Ma wants to make more money by relocating his breakfast business to a place that is cheaper than Shanghai and closer to home. Chunxia Zhu cleans fish that she will be cooking for supper. Guocheng Ma hangs up clothes on a bamboo rack inside the house before a family trip down the mountain. His children need to return to school, while he and his wife need to find a new location for their breakfast business. Jinhao gets upset when he lost his ping pong ball, one of his favorite toys to play with. Zhu does laundry by the side of a creek behind the house in rural Mashang Mount, Wenzhou. Meiting Ma, the eldest of the three children, washes her younger brother's feet before they go to bed. 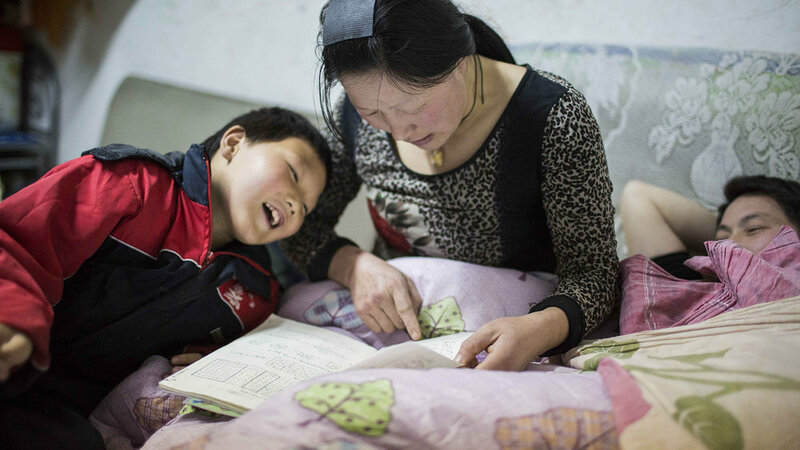 Jinhao Ma shows his math homework to her mother before they go to bed. After almost two years of working in Shanghai, Ma and Zhu can finally spend some valuable time with their kids. Although they will soon be going to Oubeizhen, a small county about 40 miles north from Mashang Mount, to look for jobs, they will be much closer to home. “The hardest thing was not being able to see my kids all year round,” Zhu said.